The most fascinating thing about Edward Snowden was how ordinary he was. This person, this seemingly very run-of-the-mill guy was suddenly the biggest public figure on the planet because he proved that all it takes is one individual willing to risk their own well-being for what they deem to be "the greater good" to shake the landscape of the country and the way people view it. Sure, it was always implied that he was a very smart man because he wouldn't have acquired his position with the CIA without being qualified, but that's really all we needed: implications. Conclusions we could form on our own about this man that sparked a nationwide debate and made any person out there holding onto confidential information wonder to themselves, would I ever be a whistle blower if I felt I was doing the right thing? Would I be brave enough to be the next Edward Snowden? Laura Poitras' documentary from 2014 titled Citizenfour handled Edward Snowden and the gravity of his situation wonderfully. Just a guy, closing the blinds of his hotel room and keeping the "Do Not Disturb" sign hanging from his room door thanks to totally justifiable paranoia. The most powerful country in the world was looking to shut him up and bring him in, and yet documentarian Poitras and journalists Glenn Greenwald and Ewan MacAskill holed up with him and filmed the interview, talking face to face with the man that would tell the world just how comprehensive and invasive the United States surveillance programs truly are. Perhaps the new film Snowden from Oliver Stone would have been more successful had it been released prior to Citizenfour (and I believe I read that Stone tried to stop the release of Poitras' documentary for this very reason), but I'm not sure if timing would have changed much. The story itself isn't any less fascinating today, and when I think of Citizenfour I get excited all over again regarding just how covert and secluded and essential the entire experience felt, yet while I was watching Snowden I was quickly disinterested by the way Stone framed the hero/villain, depending on which side of the aisle you fall on the subject, and his story. When the film first started I was optimistic, but in a matter of minutes I literally asked myself this question: do I really want or need an Edward Snowden origin story? It didn't take long for me to tell myself the answer was no, watching Stone take an extraordinary subject and turn it into a poor excuse for Good Will Hunting meets The Bourne Identity, as no matter how many Rubik's cubes Snowden solved all I wanted to do was go back to a time when I thought of him as an everyman trying to change the world. Some would say, but it's the truth, and maybe it is, but do we always need a person's full truth? Haven't we all liked the idea of someone more than their reality? 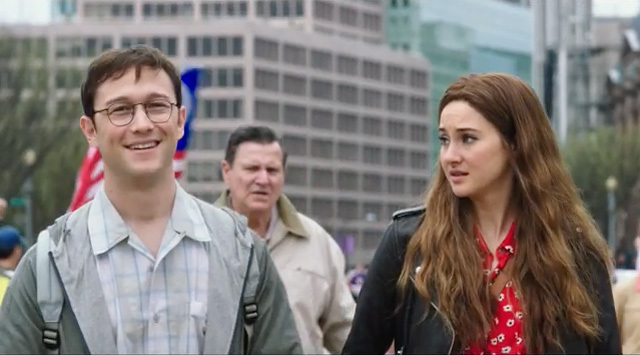 Poor casting of talented people only make the light shining on the flaws of Snowden that much brighter, creating a film that feels like actors trying way too hard to play roles. This picture isn't a disaster, it has its riveting moments and the talent involved is undeniable, but the whole of it all is far more conventional and uninteresting than such a story ever deserves to be. Go watch Citizenfour instead.